Graham authored 34 books, including his memoir, Just As I Am (Harper Collins, 1997), which remained on TheNew York Times best-seller list for 18 weeks. The spread of the Gospel is usually attributed to foreign missionaries, but the story is different in the Korean peninsula. Here the Gospel was brought by Koreans themselves. The ‘Pyongyang Revival’ or ‘Korean Pentecost’ in 1907 was a seminal religious movement for Korean Protestant Christianity. “Some of you go back to John Calvin, and some of you to John Wesley, but we can go back no further than 1907 when we first really knew the Lord Jesus Christ,” Korean Christians were recorded as telling missionaries in 1913. Kil Sun-ju (1865–1935) was the central leader of the revival. As foreign powers encroached on Korea, Kil searched for a religion that was socially engaged and offered hope for the future. Kil was introduced to the Gospel by a Christian friend who asked him whether he could pray to God as father. Kil answered, “How could man call God Father?” But three days later, while praying, he heard a mysterious voice call his name three times. Kil was afraid and prostrated himself, crying out, “God the Father who loves me, forgive my sin and save my life!” After his conversion, Kil became an ardent Christian. The Pyongyang Revival broke out in Kil’s church, Jangdaehyeon Church, after Kil publicly confessed his personal sin to church members. Hundreds of others followed his example of repentance and forgiveness to save their souls. Kil and others preached across the country as the revival spread further to China and Manchuria. The religious movement also took on political overtones and became increasingly associated with Korean nationalism. Kil was one of the key leaders in the Independence Movement of March 1, 1919, against the Japanese colonization of the country. 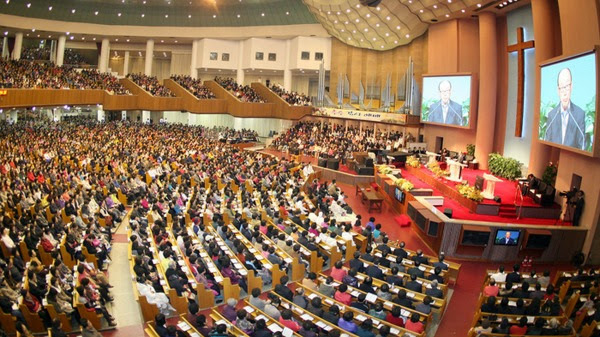 With about 480,000 members the Yoido Full Gospel Church in Seoul is said to be the largest Pentecostal Christian congregation in the world. The revival had lasting effects on Korean Christianity and on Korea. Indigenous Christian rituals such as sagyeonhoe (Bible study and the Bible-examining meetings), saebyoek gido (dawn prayer meetings), and tongseong gido (collective audible prayer) were formulated as part of Protestant practice. Korean Christian leaders led nationwide educational movements with the vision of making Korea a Christian nation. The Great Revival transformed Protestantism from a foreign religion to a new national religion, laying the foundation for the most remarkable church growth in Asia in the 20th century and positioning South Korea as a global center of the Christian faith. Christians make up more than a quarter of South Koreans and the country is responsible for one of the world’s largest missionary movements.